Come to Chateau Herálec***** and get inspired by the charm of the ornamental vegetable garden Le Potager. In the style of French gardens, it is full of vegetables, fruits, and fragrant herbs. All the colors and scents will engulf you! Throughout the seasons, more than forty species of plants are alternated in the chateau flowerbeds, which we all grow organically. Every day we collect lots of fragrant herbs, which not only create ornamental flowerbed edges but also add great flavor to the dishes in our new summer menu that is full of vitality and freshness. Our cooks and amazing gardener take care of everything from the time the seeds are sown to the time the fruits of their labor appear on your plates.The food thus tastes better and the guests can feel the freshness, quality, and fragrances of our region with every bite. Growing our own vegetables, fruits and herbs truly make us proud. Do you want to experience a real summer full of comfort and relaxation? Come to Chateau Herálec and let yourself be carried away on the waves of utter serenity in our garden swings. We have equipped not only the chateau courtyard but also our spacious park with a countless number of swings in different colors. These symbols of good times and summer will turn any moment into a carefree one. Gently swinging under the canopies of our centuries-old trees… A sensation not to be missed. On March 28, along with others, Chateau Herálec also dove into the darkest highland dark for an hour. This happened because we observe the international event called Earth Hour. We expressed our participation not only by limiting our outdoor lighting, but we also turned off or dimmed our indoor lights an all areas of the castle. We lit many candles for our guests in the restaurant Honoria. This created a unique and exclusive atmosphere, which enhances your experience beyond the delicious dishes served. We did this simple, though visible act to express that we join the common demonstration and that we are not indifferent to the future of our planet. We were considering how to make the sojourn in the castle even more pleasant for our guests, and so the idea of furnishing the most beautiful castle suite with fireplaces originated. We made through selection, we compared, and after long thinking, we chose beautiful design fireplaces from Planika and Vauni. We are convinced that the light and warmth of live fire will complete the magic romantic atmosphere and intensify the marvelous experience of sojourn in our castle. The new fireplaces were installed in the castle additionally to the fireplace of the library, nourished with logs from felled trees of the castle park, and to the fireplaces whose cheerful flames heated the atmosphere of the entrance hall and of the castle dining rooms. 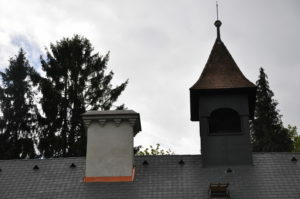 So now Chateau Herálec disposes of 13 fireplaces in total! A popular motorist show on TV Prima chose chateau Herálec again for testing of Rolls-Royce cars. This time, the stately Wraith, and the sporting Phantom Coupe got fresh air in the chateau’s park and some romantic roads in its surroundings. In one word, magnificent, isn’t it? At its very beginning, it was clear that castle Chateau Herálec would be a unique hotel also because you are also welcome together with your pet. On welcome, your pet will get a delicious dainty and its own soft towel to wipe pads and coat after a pleasant walk in our park, which has been created for their playful games. And on departure, your pet will get a surprise in form of our delicious dainty with the recipe. In honor of our furry guests, who are always welcome at our castle and whom we really think highly of, this unique “Furry book” was made, which you cannot find in any hotel. We prepared a parade of dogs that visited our castle and with nobleness enjoyed their stay here. We believe that your furry friend leaves our castle satisfied and we are looking forward to your and its next visit. Do you know that the herbarium is? The herbarium is the place used for storage of herbs that the apothecaries dried in garrets or attics of their pharmacies. As we feel respect and admiration for traditions of our ancestors you find such herbarium also in our castle, in lovely areas of Wellness & Spa by L’Occitane. We store fragrant herbs, grown in the castle part, in lovely boxes on wooden shelves, and we supply with them not only our kitchen but also our newly opened herb spa is so odorous thanks to our castle herb mixture. We mix herbs based on client’s wish, the composition of lavender and thyme, with some mint, belongs to the most popular ones. Today, we have dried a large variety of herb: ramson, thyme, marjoram, salvia, Moroccan mint… As the herbs grow in our park and herb garden, as the dried herbs are added. Later the collection will be enlarged with fruits, cones etc. and presented to our kind guests. Maybe you remember of your school years and of the collection of herbs and their drying and pressing in newspapers sheets under the pile of books and of their sticking on clean pages of the new herbal. We have prepared exactly the same herbal. The large book with flowers and herbs, grown in the castle park, has now its dignified place in the herbarium. 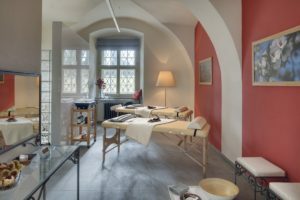 First Spa by L’OCCITANE in the Czech Republic at Chateau Heralec! 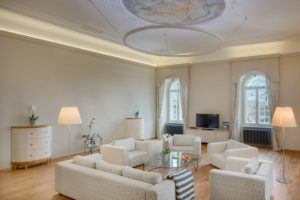 The high standard of services provided at the hotel, the castle’s unique atmosphere that is reminiscent of the fabled French castles in Loire, and our philosophy of relaxation in connection to nature all contributed to the decision of L’OCCITANCE of Chateau Heralec to be the first facility in the Czech Republic to carry out their unique wellness & spa concept. Our castle L’OCCITANE Spa guarantees to provide you with a spa experience equivalent to the one you would receive in the original Spa L’Occitane in the 5* hotel Couvent des Minimes in Provence. Experience true relaxation and indulge in the luxurious comfort of our castle hotel with the natural cosmetics of the highest quality, L’OCCITANE. 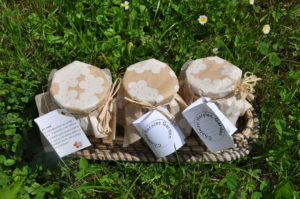 The authentic ingredients used in the making of this unique natural cosmetics line together with traditional massage techniques create a package of utter relaxation. Just entering our massage parlors will make you more relaxed, the interior design inspired by the unique and beautiful nature of the Provence region Camarque. The country, ingredients, and rituals of the Mediterranean are the building blocks of the Spa L’OCCITANE procedures that our well-trained therapists and staff will gladly administer. The procedures offered by the Spa by L’OCCITANE aren’t only aimed at women, as it may first seem. The Spa by L’OCCITANE brand offers complete product lines as well as spa procedures aimed specifically at and for men. The amazing experience you will have chosen any one of the spa procedures or beauty treatments offered by the L’OCCITANE spa in the luxurious environment of our hotel cannot be described in words. You have to come and experience it yourself. Delicious homemade honey from Herálec is worth of trying! A new tasty edition has been added to the castle Gift Collection – Garden Edition: homemade honey from Mr. Brabenec of Heralec. He has been making it for decades and his love and passion for the craft is absolutely evident. As we share his passion for healthy and tasty things, we immediately decided to incorporate it into our new edition of the Chateau Heralec Gift Collection – Garden. This particular honey is from the second round of collection, and it is truly wild forest honey as Mr. Brabenec lets the bees freely graze in all the surrounding forests. We have found many uses for this natural gem – we serve it with breakfast, add it to our special castle lemonades or as a natural sweetener to our teas. Enjoy! Our guests can visit castle observatory, located in the highest placed turret in the castle. It towers up into the sky in the South wing of the castle, so close you can almost touch the stars. The entrance is located in the so-called ‚Angelic‘ wing, right by the wellness & spa entrance. Right behind the door, you can find a staircase leading to the small but cozy tower where a truly impressive panorama lends itself to you – a deep black and blue night sky with thousands of sparkling stars. In the observatory, you can find a telescope as well as a map of the night sky. In the winter months, we recommend warm attire and a glass of mulled wine! In case you are interested in visiting the castle observatory, please contact the reception for further information. For our guests that choose our largest and most luxurious suites to reside in, we have prepared a small surprise. To enhance your personal comfort and joy, we have equipped both suites, Lords Trcko from Lipa and Lords of Solms, with their very own personal wine fridge! Although we have picked the various interesting wines ourselves, in case your favorite wine is missing from the selection, please do not hesitate to tell us and we will stock it up for you right away. This way, you can enjoy a glass of wine in the privacy of your beautiful suites at any time! Discover with us the miracles of the English park that surrounds the Heralec castle. We will lend you our beautifully printed tour guide on your walk through our park, that will detail the various flora and fauna and other interesting things in the park. Trust us, there are plenty! Let yourself be taken away by the velvet of the red oak tree leaves and listen to the silver wind, rustling the tree canopies. The history of the park is well mapped in comparison to other castle parks. Historical maps – prints from the 18th century and a period plan of the castle park with a very distinct roadmap from the 19th century – were retained. The park today, including the parterre in front of the castle’s main entrance, surrounds the entire castle. Up to the second half of the 19th century, however, the land on the north and north-western sides of the castle was used for agricultural purposes. A statue of St. Agasias from the first half of the 18th century also still stands in the park today. We believe that it still guards and protects up from illnesses. Your first steps in the castle park by the eastern gate will take you directly to the castle, walking on a newly built granite road. The castle parterre has been protected for centuries by the magnificent beech tree that has become a symbol of Chateau Heralec. Opposite to the castle entrance, you can find original cut bosquets on 3 locations, complemented by comfortable benches. As we walk further on into the park, we find ourselves in a grassy area with many canopies towering above. Behind the castle, you can find a wide open area, fresh and breezy. Solitary old linden trees dominate the central grassy plane. The plane itself is surrounded by a ‘border’ or both deciduous and coniferous trees that despite their presence do not make the area seem closed off. One can also spot various other interesting tree types, for example, the horse chestnut, the sweet chestnut, various oaks, and beeches, as well as the yellow poplar. According to experts, around 9 trees in the park are over 300 years old. During an orientation survey that took place from August-October of the year 2009, more than forty types of birds that probably nest and live in the park were discovered. From an ornithological point of view, the most important species are those that are bound to tree hollows. Eco stabilization of the surrounding environment is one of the most important functions of the park, contributing to the biodiversity of the area. 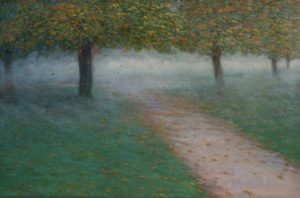 The revitalization of the park was carried out in a way that did not disrupt any of these biotopes and ensured a very natural way of nurturing several harmed trees. In our tour guide booklet, you can find out various information about the bird life in the park. In the EXPERIENCE section of our website, we present to you a new section titled „TIPS FROM THE CASTLE LADY“. We will provide all our fans and guests of Chateau Heralec with the most up to date tips for attractive places to visit and things to experience in the region. It is our hope that through the eyes of the castle lady, you will be inspired to travel to the most attractive places in the region. Starting out, the castle lady will present to you various places she has visited upon summer vacation trips with her children. At the moment, you can read about their visits to the BLUEPRINT WORKSHOP of the DANZINGER FAMILY, the WATCHTOWER IN BOHDANEC or THE GOAT FARM IN VOJSLAVICE. New ideas on where to visit will come very soon. Do not miss a chance to read this new section and find out more! We invite you on a historical journey through Chateau Heralec. You can find a small booklet about the history and present day of this beautiful castle in every single room, taking you on an interesting journey through the whole castle. All this information was already prepared for our first visitors during our Open Days in the summer of 2011 before the hotel actually opened. The extent of the curiosity and passion of the Czech people for the history and success of the reconstruction was showcased by the number of visitors that showed up that day: an incredible number of over 3300 people visited Chateau Heralec that day! You can read this small booklet and take it with you wherever you wish, going through the public areas one by one while reading the relevant information. You will, for example, find out, that horse stables were once in the location of what is now our Ancestor’s Hall. A discovery of the remains of an old furnace in the room next door, what is now the fitness area, points to the possibility of the old castle kitchen being located in that very spot. Pick up our booklet to find out more! The scenographic, or so-called gallery concept, that has been utilized in the castle interiors and individual rooms is absolutely unique and finds no match near or far. 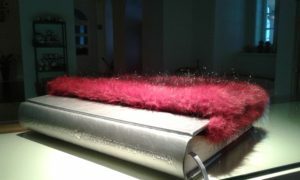 It was created in the artistic workshops Studio 3 in close collaboration with the Regional Gallery of Vysocina. Thanks to a very fresh mind of its current director, Mr. Ales Seifrt who believed in the idea or installing large-scale wallpapers in Heralec, everything fell into place. Original paintings from Czech painters, taken from the RGV depository, served as the basic elements in the wallpapers. We chose 18 paintings from over a 100 in the selection, which we then photographed in high resolution, transformed into the wallpaper and installed in the rooms and public areas of the castle. During the installation process, we learned more than a few things about the skills needed to perform such a task. The result is truly mesmerizing. The paintings are as if alive, showcasing every brushstroke and piece of the technique used in the creation of the pieces. The cracks in the painting, created by the hand of time, are so realistic you want to touch them with your fingers. All of a sudden, you discover elements of the painting that are almost invisible in the original, such as a peasant woman with a goat amongst the trees. A road through the park of Jan Honsa will take you directly to your bathroom, while in the room By the Sazava, you will immediately feel the atmosphere of life by the river in times long by. The entire concept was completed by the decision of the Regional Gallery of Vysocina to lend the original paintings to Chateau Heralec so we could hang them on our walls. Hence, all our guests have not only the opportunity to marvel at the beautiful wallpaper but also at the originals and make a comparison between the two. All the pieces in the castle have literally ‘spoken’. Come see for yourself!